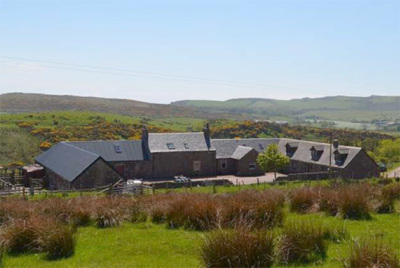 Glenkerran is an idyllic property with 22 acres on the Kintyre peninsula on the west coast of Scotland. The house has been substantially renovated recently and provides family accommodation over two floors. Accommodation includes the inner hall, gun room/rod room, sitting room, kitchen with Aga, hall, living room with open fireplace, sun room and five bedrooms and two bathrooms on the first floor. Adjoining the house is a traditional outbuilding of stone under a slate roof, some of which has been converted into living accommodation, and if the necessary consents were granted would make very good additional accommodation. The house comes with five cottages and a range of traditional outbuildings which could also be converted to residential accommodation. The land slopes down to the Kerran water, which provides the opportunity to catch the odd migratory fish. Two grazing paddocks lie north of the farm track, and are sheltered by a neighbouring woodland plantation. All sporting rights, such as there are, are part of the property title. Glenkerran is located on the Kintyre peninsula on the south-west coast of Scotland. The property is close to the coast near Southend, which boasts a village shop, tea room, hotel, church, primary school and a doctor’s surgery. Campbeltown is seven miles. The guide price is £360,000. For further information please contact CKD Galbraith on 01786 434 600 or visit www.ckdgalbraith.co.uk.